Fantasy Gacha Carnival. An event that I hear from little whisperings that people look forward to each round with bated breath. I am always up in the air about gacha events. Personally, I like to just outright buy what I like, gacha is evil and steals my lindens and I never seem to get the one that I wanted. BUT… I do seem to see a lot of folks who truly enjoy the chance taking and the fun that is involved. This round I decided to do something a little simpler but just so very adorable. 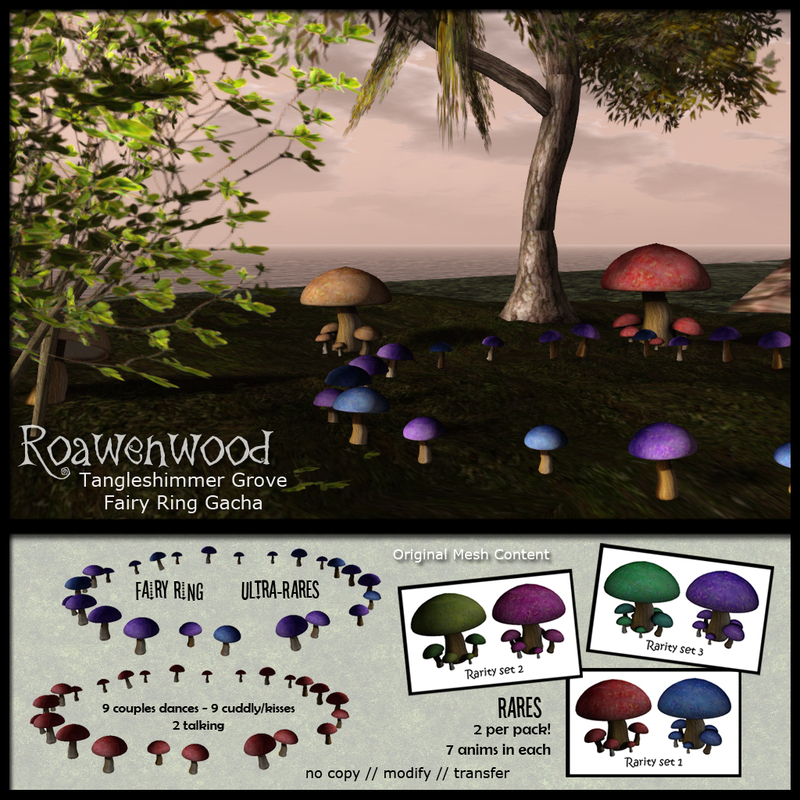 The denizens of Tangleshimmer Grove have decided to let you the wandering souls who like to have a bit of fantasy in your life share in the joy of their fairy circles. 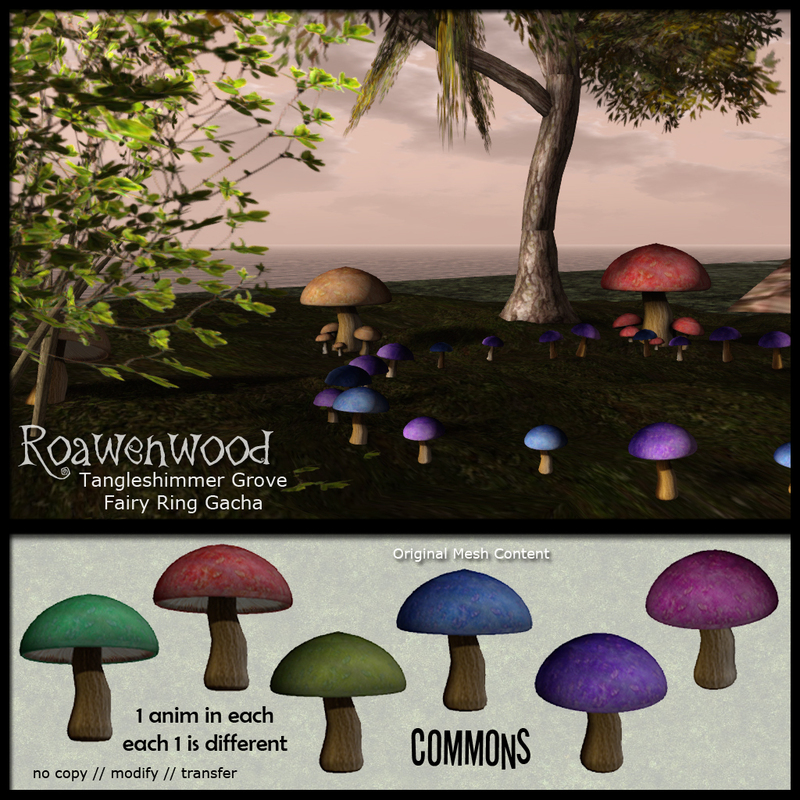 The Tangleshimmer Grove gacha’s are too cute and done in robust colors that draw the eye. The commons are simple, a single mushroom sit that you can lounge on or if you’re lucky to win the right one maybe a good bounce. Six different colors to be had. Rares are a sweet little mushroom cluster. Nestled amongst the wood or underbrush each one has 7 different animations in it for playing, bouncing, lounging, kicking back and relaxing. These guys come in packs of 2, each pack has two different colored clusters, and each one has the animations in them. The ultra-rare…. a fairy circle. Fairy rings are extraordinarily magical places that are a place of merriment. Not just anyone is allowed to dance amongst the fairies or within their circle but you could be one of the few lucky ones to win one. Two variations one is red, the other is a mixed version with blue and purple mushrooms in it. The ring has several animations in it for couples. 9 different couples dancing sets including lots of slow dances, sways, and then a couple faster jauntier ones to relax with. Included also are 2 sets for just standing around talking, and then 9 more couples sets for cuddly, kissy face, lovey stuff. In total 20 couples animations sets. All embedded, we have got away from the poseball thing thankfully and perfect for that out of the way spot where you might like to have a little something extra.